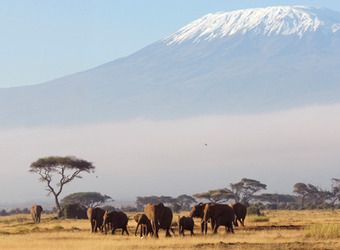 Elephants abound in Amboseli, and to see these African icons against the backdrop of snow-topped Mount Kilimanjaro is a timeless image of the continent. This mosaic of dusty plains and swampy springs is also home to buffalo, wildebeest, zebra, impala, hyena, lion, leopard, cheetah and a third of Kenya’s nearly 1,100 bird species. The nearby photogenic black lava Chyulu Hills are a captivating area of ancient craters, rolling grasslands and aromatic cedar forest. On a clear day, the view of Mount Kilimanjaro from Amboseli or the Chyulu Hills is an enduring and inimitable impression of Africa telling you that you have arrived. In Amboseli, venture out from camp each morning and afternoon to view the famously photographed and long-researched elephants of the park that dust themselves in the dry lake bed and migrate towards the marsh each day to drink waters fed by the mountain’s melting snow. With an adjacent private reserve, walks can be conducted with guides, sumptuous bush meals are delightful, and sundowner cocktails are often enjoyed at sunset. In the Chyulu Hills, active travelers can get on the ground with guided wildlife viewing by mountain bike, horseback riding, guided nature walks, scent tracking through the woodlands with bloodhounds and interacting with local Maasai herdsmen. There are also morning, afternoon and night wildlife drives by open, 4x4 safari vehicles with charismatic local guides. Amboseli is chiefly known for its bountiful elephants, some of the largest in Kenya, that frequent its contrasting dry Pleistocene lakebed and deep, lush swamps. Getting close to these sizeable creatures is a given. Cynthia Moss has led elephant research here for over 40 years, specializing in the elephant behavior, and her research center can be visited. Other resident wildlife between Amboseli and Chyulu Hills includes lion, leopard, hyena, Cape buffalo, Maasai giraffe, Burchell’s zebra, impala, wildebeest and many other species of plains game are plentiful. Cheetah, gerenuk, and fringe-eared oryx are often spotted around Chyulu Hills, while rhino and the other big five are present but sometimes elusive. Birds of Amboseli include a broad range. Colorful grey crowned cranes are drawn to the marshes, you may see flamingoes as well, and a variety of egrets, eagles, owls, bee-eaters, herons, larks, hornbills and much more can be found here. Amboseli fits into a classic Kenya safari. Amboseli’s swampy marshes filled with elephants and magnificent views of Mount Kilimanjaro link well with the more arid landscapes of the north, such as Samburu, Meru and Lewa, where unique species, like the Grevy’s zebra, reticulated giraffe and Somali ostrich can be viewed and cultural interactions with Samburu herdsman can be enjoyed. 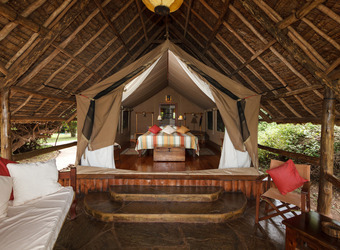 You may have views of another iconic mountain, Mount Kenya, from your camp and wildlife drives. From the north, direct access to the Maasai Mara rounds out the safari with the migration of over a million wildebeest, zebra and gazelle in the dry season and year-round resident wildlife, including lion, cheetah, rhino, Maasai giraffe, Burchell’s zebra and much more. Beyond Kenya’s borders, Tanzania’s Serengeti sees wildebeest dropping their young between January and March, and the iconic Ngorongoro Crater presents yet another geological wonder and a menagerie of wildlife. When did you visit Amboseli / Chuylu Hills?